Very quickly, before they disappear offline, I liked these two pictures sold at Lawrences of Crewkerne yesterday. Her dress has a pattern of carnations – innocency, virginity, so appropriate for Lady Arbella, still unmarried at this date – and sweet peas. I’ve looked for a symbolism for sweet peas. Modern sources (Interflora) suggest ‘blissful pleasure, thank you for a wonderful time.’ Shakespeare mentions peas among the fruits of Ceres in The Tempest and their pods must be an allusion to pregancy, so a wonderful time, past or future, sounds about right. Lady Arbella Stuart didn’t have a wonderful time. She was King James’s first cousin, the daughter of Lord Darnley’s brother Charles Earl of Lennox and a great-granddaughter of Margaret Tudor, King Henry VIII’s sister. Arbella was born in England, so in many people’s eyes she was a better candidate to succeed Queen Elizabeth than James. 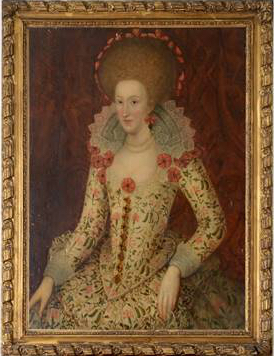 Her grandmother Bess of Hardwick brought her up at Hardwick as Royalty. 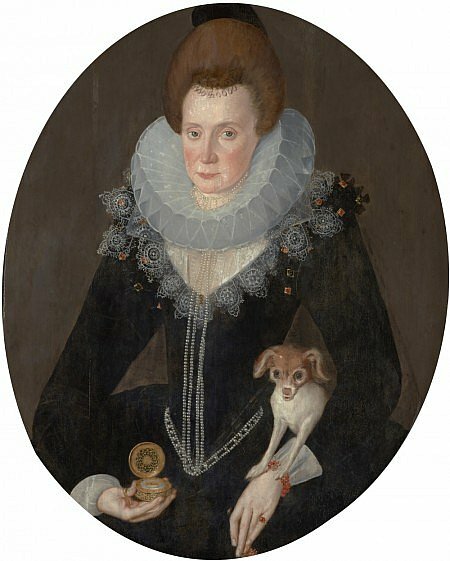 Her food was tasted and she was called ‘Highness.’ The palatial Great Chamber floor at Hardwick may have been built with an eye to receiving her there as Queen. 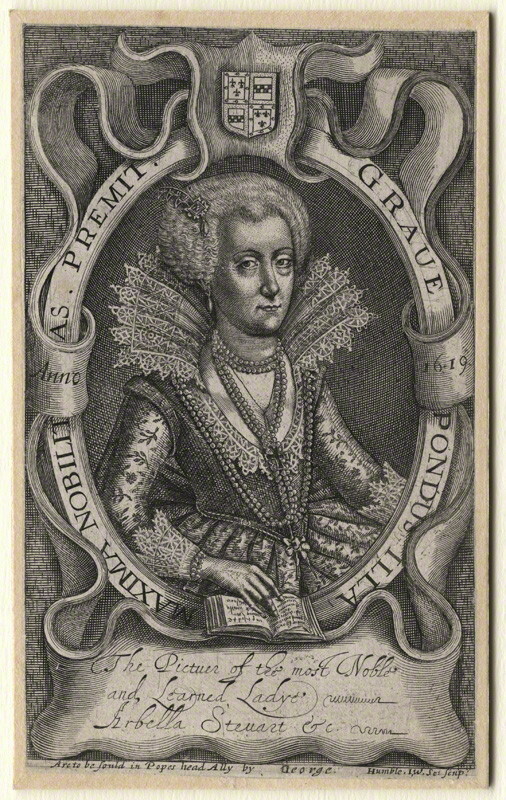 Arbella was described as ‘Learned’ in a 1611 poem by Aemilia Lanier and in an engraving of her portrait in 1619 (NPG) where she is shown with a book. There is a strong intellectual strain running through the Tudor royal women. But unlike Queen Elizabeth, Arbella didn’t inherit Tudor prudence, and she made a fatal marriage. She fell in love with William Seymour, 2nd Duke of Somerset. Seymour had his own claim to the throne through his grandmother Lady Catherine Grey, sister of Lady Jane, granddaughter of Mary Tudor King Henry VIII’s other sister. King James imprisoned the couple, eventually shutting Arbella in the Tower after she and William tried to escape to Continent together. Arbella had disguised herself as a man, one of the reasons that Imogen in Cymbeline is said to be based on her. William reached Ostend safely; poor Arbella died in the Tower in 1615 by starving herself to death. Arbella’s portrait in the SNPG tells the awful truth of being a collateral heir to the throne, even as late as the 1610s. 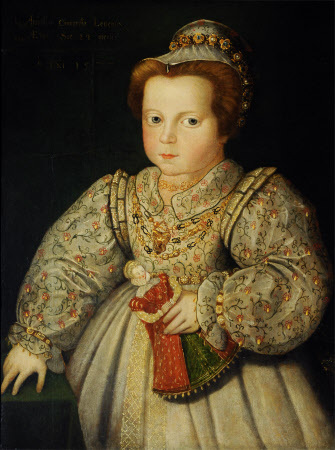 Peake shows her prematurely aged – she would have to be only 35 in the painting – and holding a watch to symbolise the inexorable passage of time. At best it was such a person’s duty to live as quietly as possible and die unmarried. At worst, they could still be thrown into prison like Plantagenet heirs a century before. Arabella wasn’t summarily executed, but the result was the same. Thankfully she was the last person to suffer like this. There is a story that she and William Seymour had a secret child. It’s a lovely idea, but it may be no more than a story. 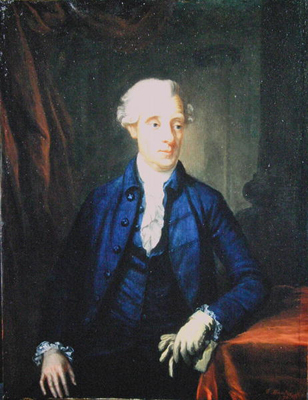 The second portrait at Lawrence’s was more straightforward. 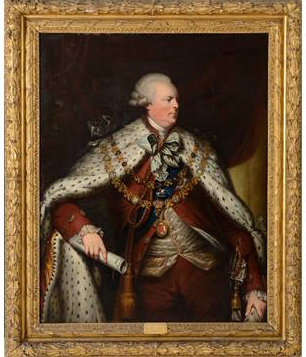 This portrait of the Marquess of Buckingham in robes as Lord Lieutenant of Ireland c.1788 was cautiously ‘attributed to’ Robert Hunter (fl.1752 – 1803), Ireland’s answer to Reynolds, but it was clearly autograph. It sold for £9,900 plus commission, just above £6,000 – 9,000 estimate. I was sure it was Hunter not least because the waistcoat was so characteristic. I knew an exact comparison in a portrait that Philip Mould had some years ago, a portrait of Viscount Harcourt. Only when I looked Lord Harcourt’s waistcoat wasn’t as I’d remembered it at all. (c) Philip Mould & Co.
Why did it look so familiar then? Time for breakfast.